Contrary to what you might have heard, you don’t have to be able to draw to paint watercolours! Our one day “playday” will help you to discover the wonderful world of watercolour. We will provide all the materials, just bring your enthusiasm. Barb will have you mixing colours in no time, creating a colour wheel, applying washes and watching the paint mix and mingle on the paper. 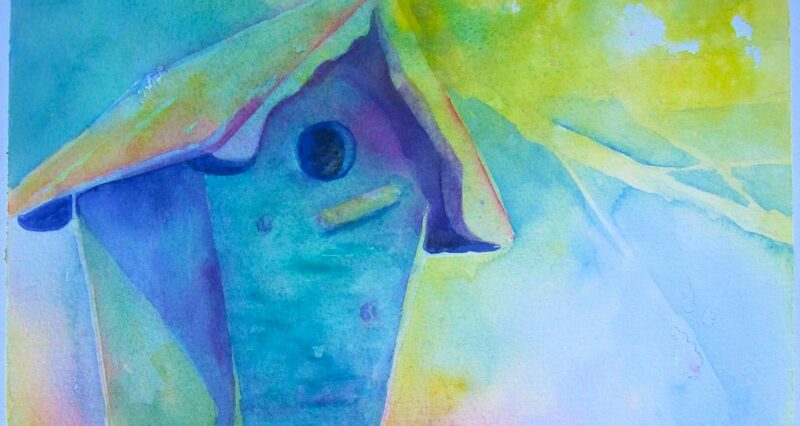 Barbara has been teaching watercolour at Artbarn for 11 years – check out her artwork online. Barbara Hotson (Honours BA, MA) is a visual artist endlessly challenged and intrigued by the interaction of water, pigment and paper. According to her it is the unpredictability of the medium of watercolour that keeps her hooked! She spends time thinking and planning and drawing a piece and then has to let go of control as she paints. The suspended particles of pigment in the water create a blend all their own on the paper. She feels as if she is merely the facilitator. Barbara paints in series which arise out of what is concerning her at the time. Country Roads reflect the landscape near their farm up north near Thornbury. Beaches mirror her love of the ocean and the spaces beside it. Gates is about the transitions in our lives. She exhibits at the Autumn Leaves studio tour and many other venues in Toronto, Collingwood and Florida.